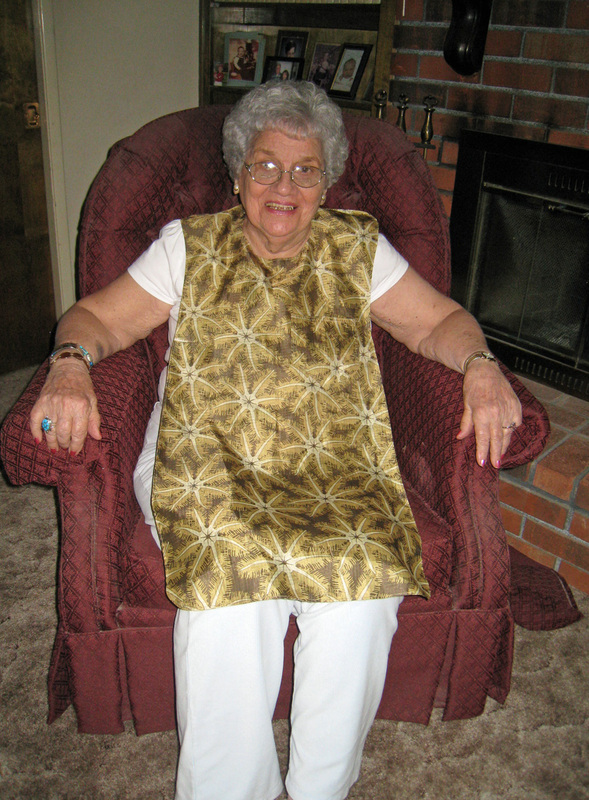 “Necessity is the Mother of Invention” and my mother, with Multiple Sclerosis, asked for a clothing protector to go to her lap that was “stylish” for dining. Since her birthday was the next week, and all I could find were dull and child-like bibs, I set to work that day, sewing a fashionable accessory she’d feel good about wearing, to catch those spills. I used the newspaper to draw my first pattern and found fabric in the closet I knew she would love. My mother adored it and soon her retirement home friends, were requesting one, too. Helping them and others was keeping me busy and got me thinking how it could be improved upon, especially remembering how my father, with Alzheimer’s, could have used one of these, too! “Let’s make them water and stain resistant, with a pocket and reversible”, I thought. “Let’s have fashion choices for men, women, children and a tote to store them, too!” Then, I travelled to retirement homes in numerous states asking for their input, which was invaluable. The process took longer than I’d hoped, but with my husband’s encouragement and technical computer skills and our Reps, who are just as enthusiastic, we were blessed to launch TidyTop in 2013. Our goal is to bring style and smiles to many more people preferring to keep their clothes spotless, with dignified dining wear, for all ages! It is like nothing you've seen before with its special light, stain resistant and soft to the touch fabric. The inspiration will forever go to my mother and the smile face in the “o” of TidyTop to our son, Kevin! May TidyTop bring a smile and Blessings to you and yours!